Nightclub comic Morty Gunty (1929-1984) began his stand-up routine in the Catskills in the early 60's, appearing on various television programs such as The Ed Sullivan Show, The Jack Paar Show, he made the talk/variety show rounds like most up and coming comics did. He debuted on Broadway in 1967 in "Love in E Flat" and hosted his own local television show for children called "The Funny Company". His only venture into films would be What's So Bad About Feeling Good? and Woody Allen's film Broadway Danny Rose. 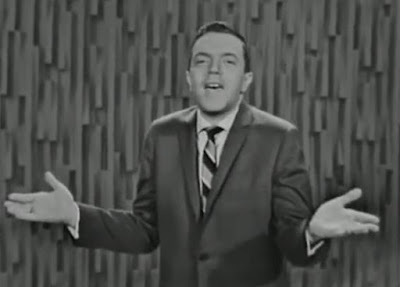 Here's a video clip of Gunty doing his stand-up comedy on The Ed Sullivan Show in 1965. He was a friend of my father's and we saw him in the Borscht Belt many times. Once when I was a kid he brought me up on stage and did some schtick with me being the straight man (I knew all the routines). Very memorable for me. Morty Gunty was a very nice man but not a very good comedian. He borrowed shtick from Jerry Lewis and others. But he was an excellent TV host and very much loved by children.